"Why Active Kids Make Better Learners"
“Physical activity has dramatic effects on individuals’ physical mental health,” according to Charles Basch in his report, Healthier Students Make Better Learners. Put simply, educational outcomes are directly influenced by health. It is no surprise that students’ fitness levels continue to be low and obesity and overweight categories in youth continue to climb, presenting cascading and troubling trends toward overall student health and fitness. Is it any surprise that 8.4% of school age youth have been diagnosed with attention-deficit/hyperactivity disorder (ADHD)? 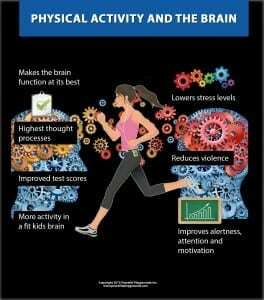 Continue reading Physical Activity and the Brain.